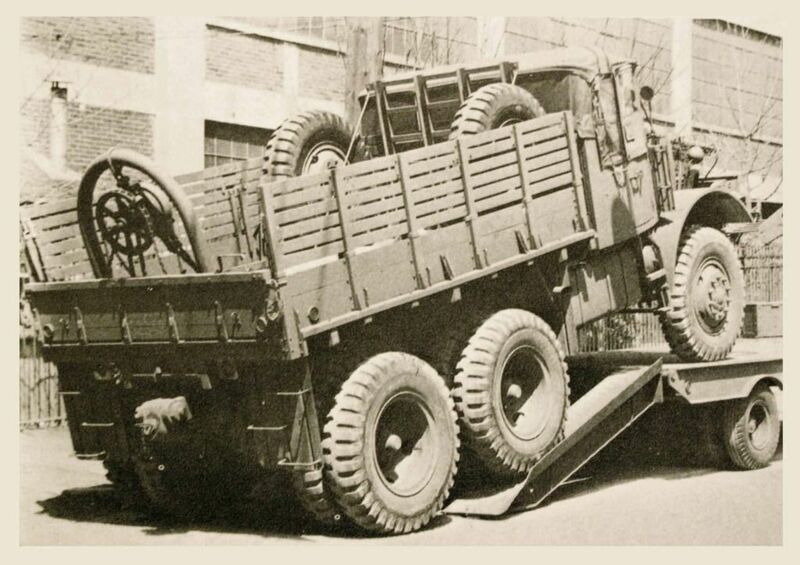 The wooden load box for the Mack was built by the same sub-contractor that built the early load boxes for the GMC Deuce and a Half. 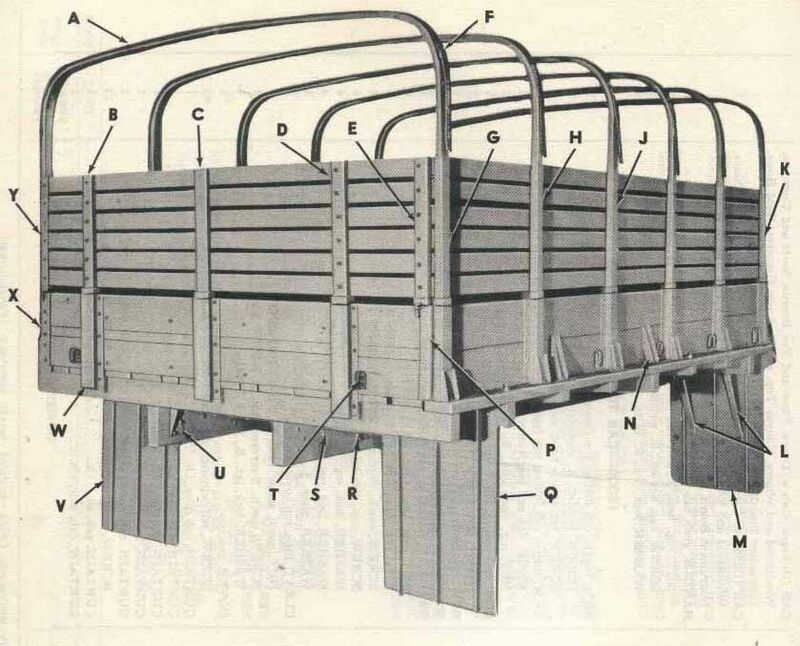 The load box fencing was the same length and height on both vehicles so it is no accident that the overall design and the metal hardware were similar on both. 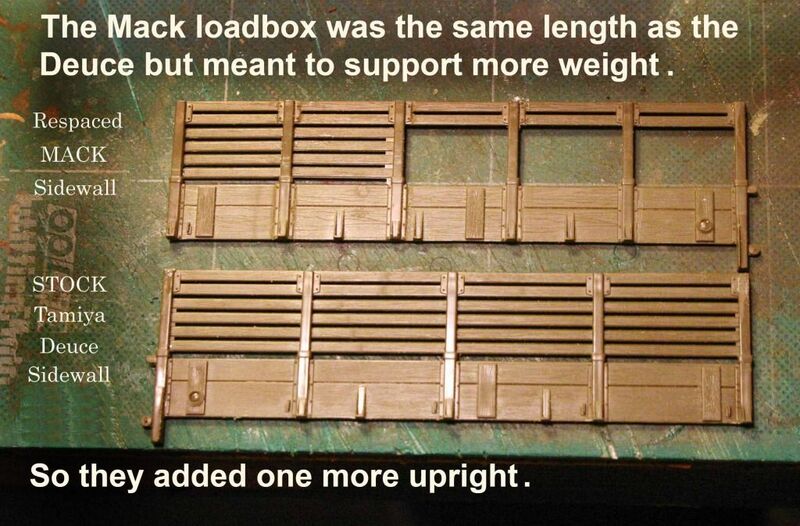 The only difference: The Mack had six vertical uprights instead of five as on the Deuce. I started with the load box sides off the Tamiya Deuce but I had to add one aditional upright and re-space the other five. 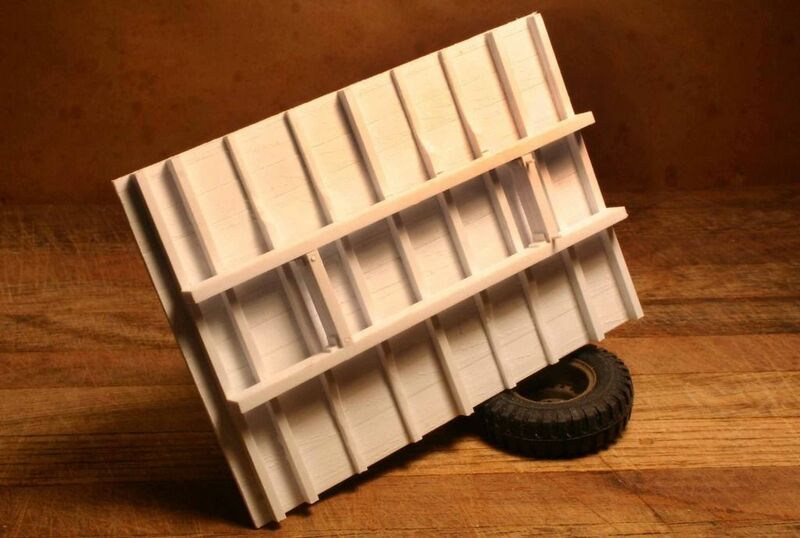 I used a saw blade scrapped along the length of the Evergreen plastic to create the wood grain in the load box floor. Then lightly sanded the now destressed "wood" to knock off the high spots and give the floor a well used look. 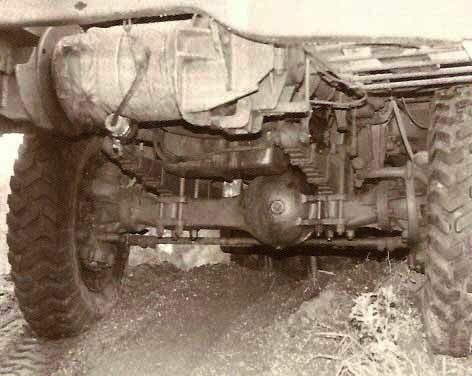 The Mack had a similar front differential to the Dragon Wagon however the Mack had a slightly wider stance and also the differential was off-set towards the driver's side for more underbody clearance. 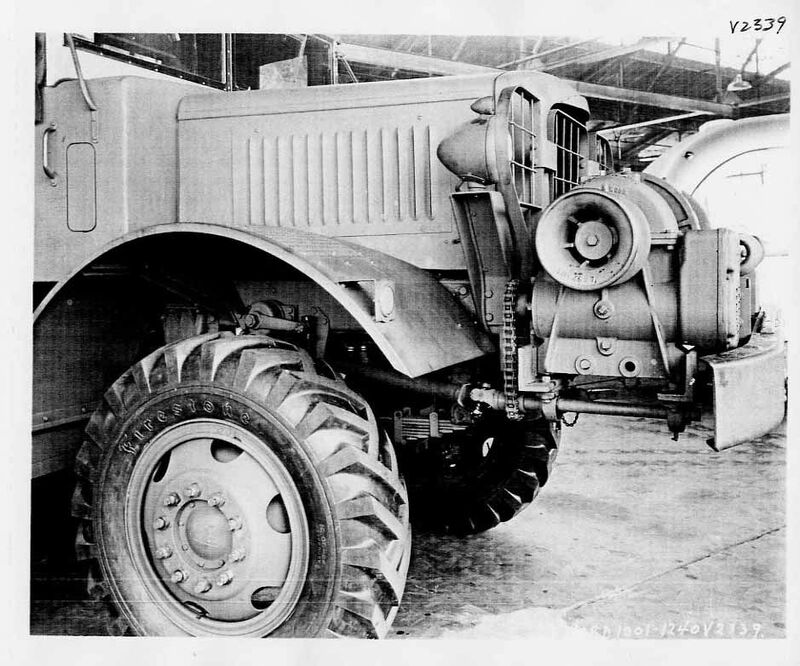 The Dragon Wagon had the differential centered on the front axle. 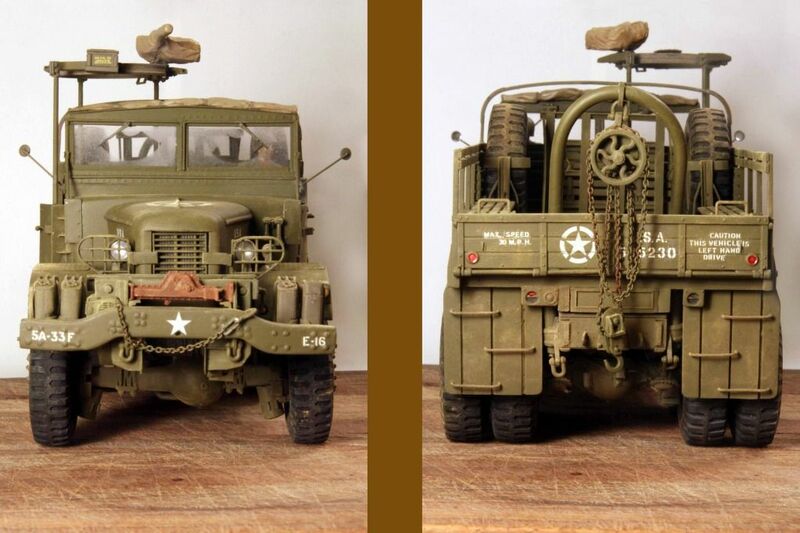 The inverted Gar-Wood winch on the front of the Mack is (more or less) the standard 20 ton unit as used on the Pacific Car & Foundry M26 Dragon Wagon. 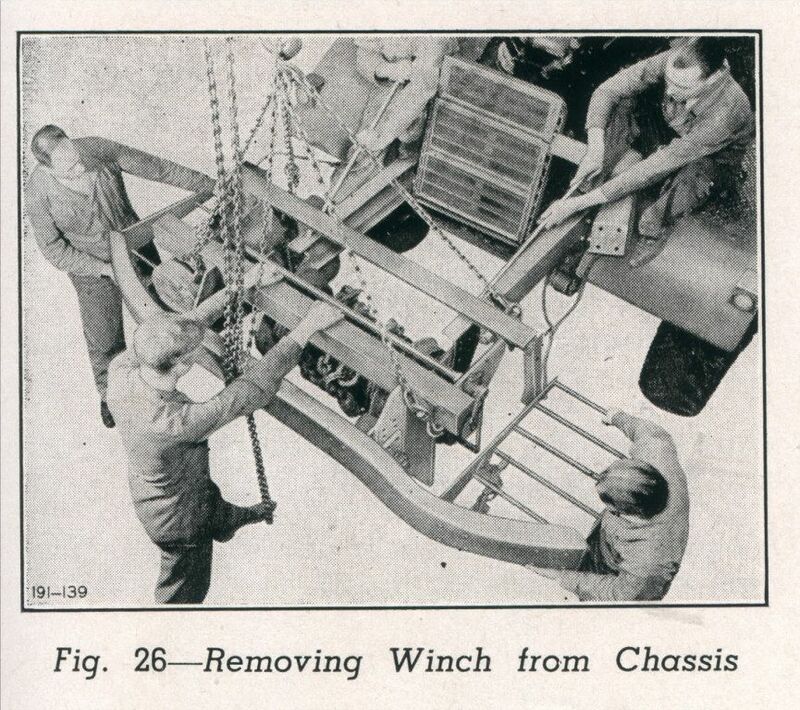 Changes made by the Gar-Wood Company to accomodate the NO6: The winch drum on the original Mack had to be narrowed on its' shaft to clear the two frame members coming through the winch assembly . 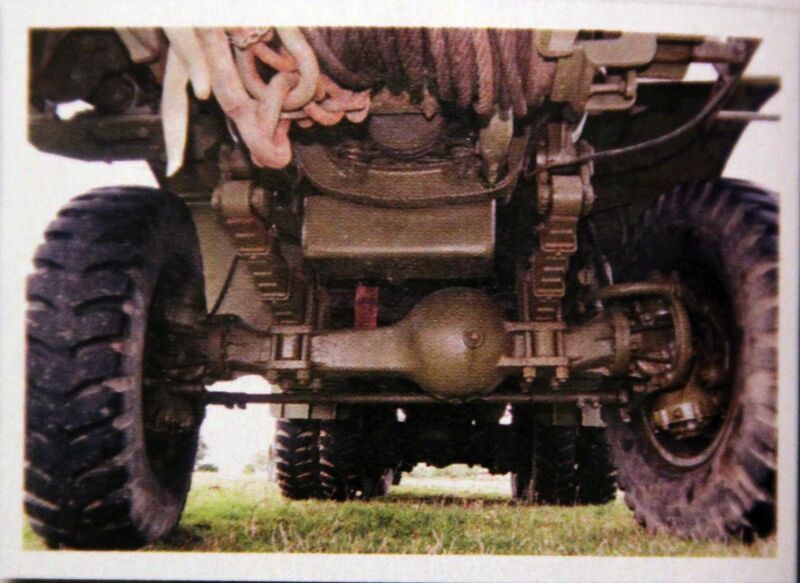 Also the drag brake on the winch was not the band style as on the M26 but an earlier brake block design. 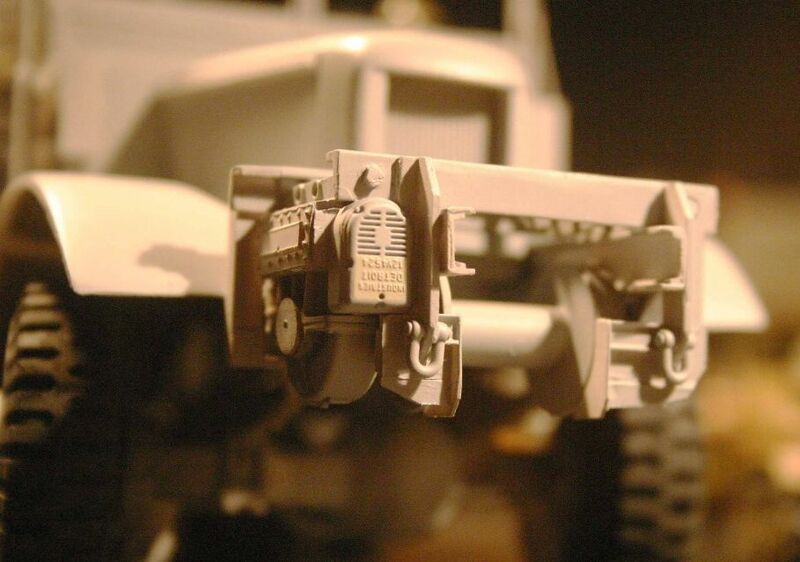 PLEASE NOTE: The axle retainer bolts added to the Mack. 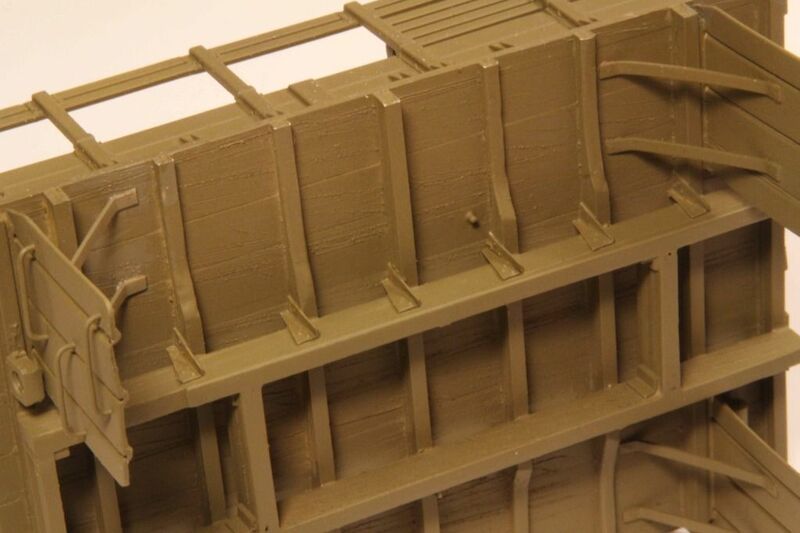 For some reason this is a significant detail that was also left off the front axle of the Tamiya Dragon Wagon. Easily added with some Evergreen octagonal stock. Undo the 8 to 10 large mounting bolts and the entire winch, bumper and ladder rack assembly would slide off the end of the frame. The redesigned earlier style drag brake has yet to be built for the Mack winch. 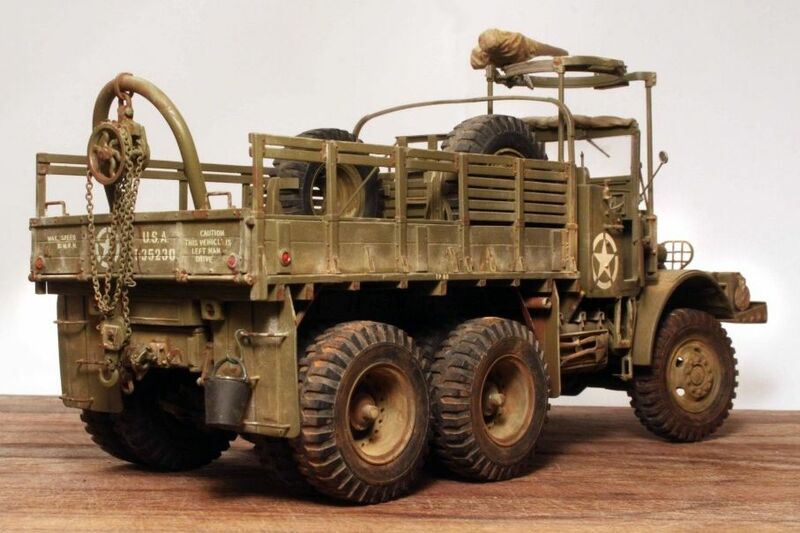 Original prototype winch design for Mack NO used the totally stock 20 ton Gar-Wood winch mounted directly on top of the frame members. 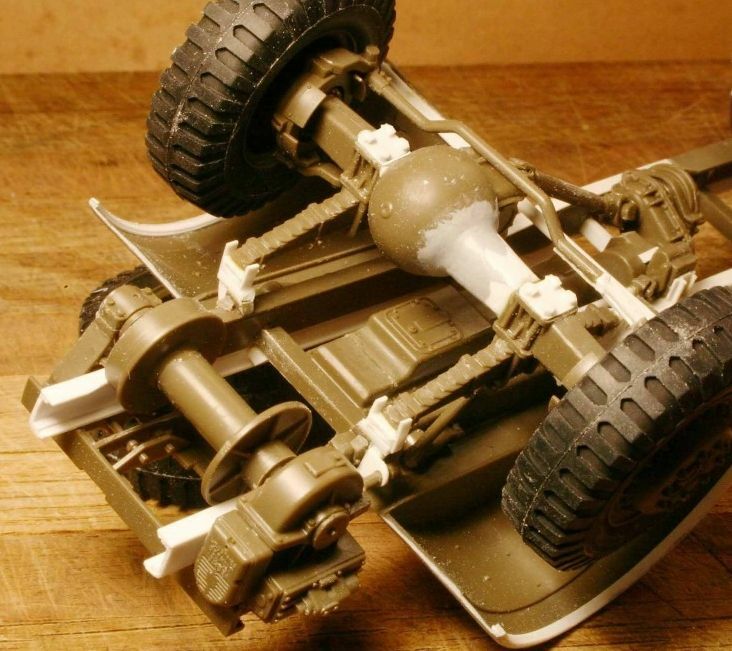 Unfortunately as the winch approached anywhere near its maximun pull the twisting force placed on the assembly would perminently distort the frame members and destroy the vehicle. 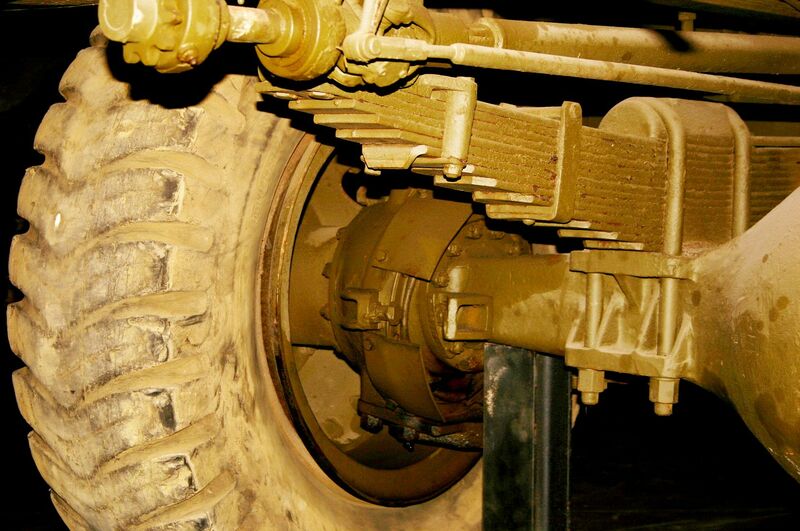 The inverted design allowed the axis of the winch drum to be much lower and more in line with the frame members avoiding this problem. In this case I needed a total of four matching side plates to make the two racks. I cut four exactly equal lengths of Evergreen plastic stock but intentionally cut them longer than needed. 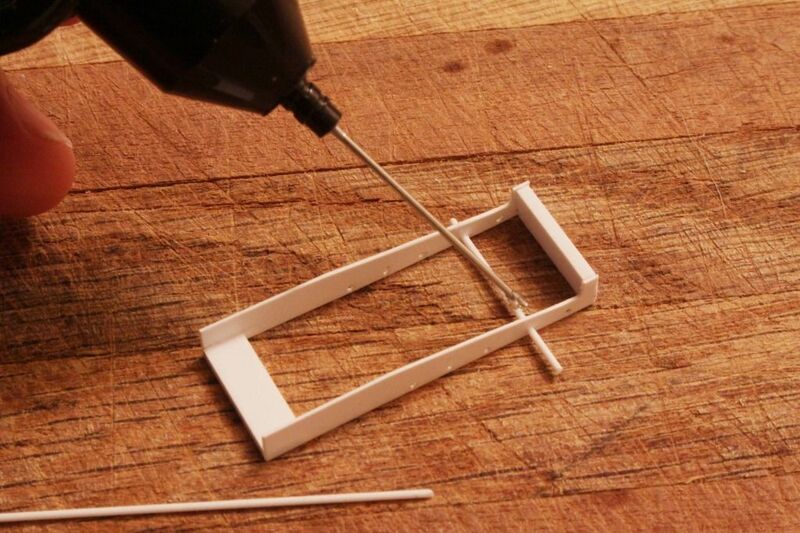 I then glued the four pieces together at each end using only the last 1/8 inch of the overly long stock for the glue. 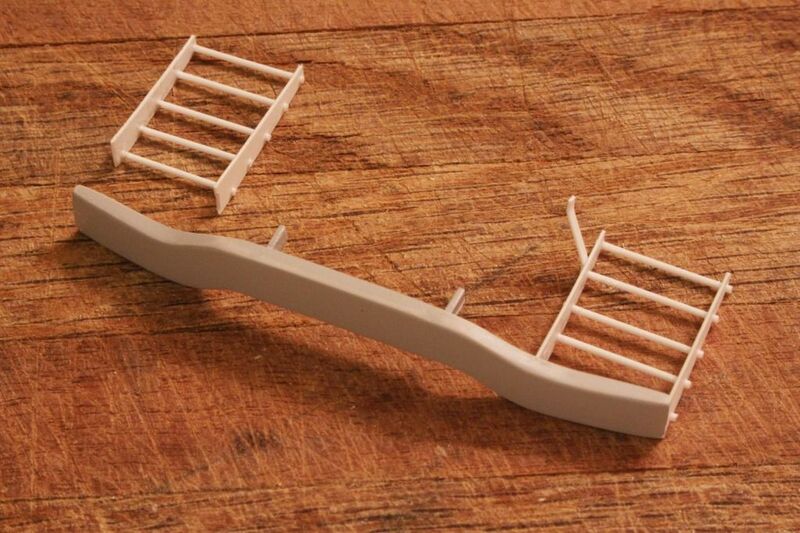 After the glue has completely dried, sand the stock to the desired profile if necessary and drill all four pieces at the same time to provide matching, equally spaced mounting holes for the ladder rungs. After drilling and shaping, carefully seperate the four drilled pieces. 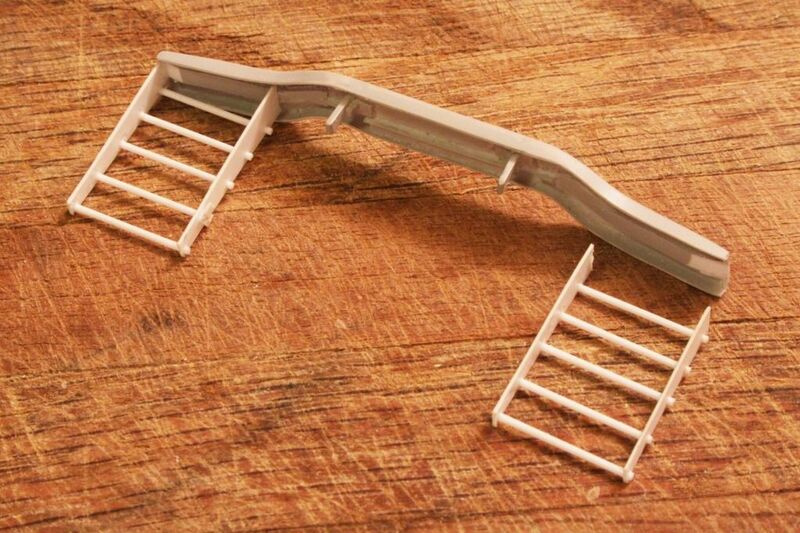 Now manufacture four EXACTLY EQUAL spacers that will give you the desired ladder width required. Care should be taken at this step otherwise you ladders will not be "square" when complete. Awesome built. Thank you for sharing. 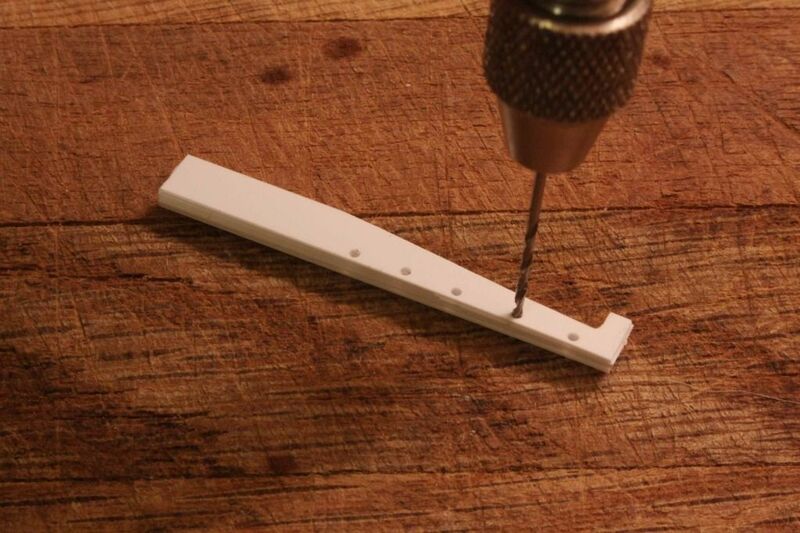 Assemble the side plates and the temporary spacers with glue. I carely layed the assembly on the work bench and blocked it into a carpenter's square as it was drying to insure the finished rack would be square. 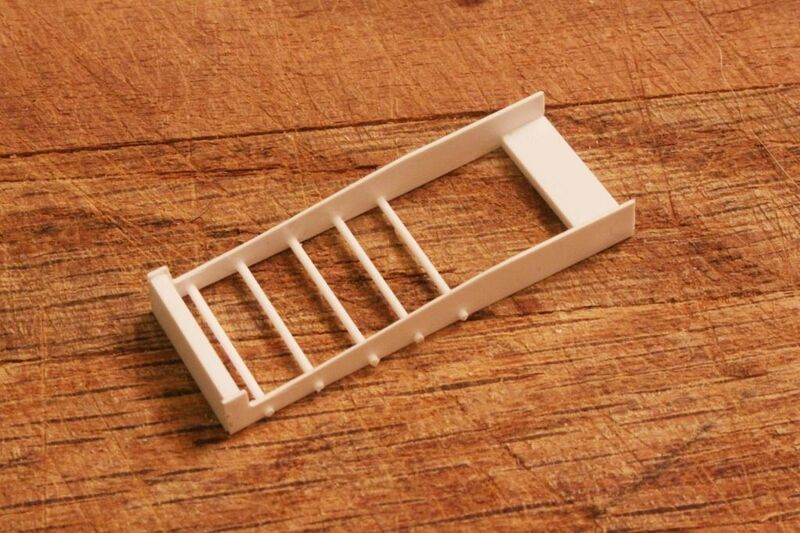 Once the spacer assembly is completely dry insert plastic rod into the drill holes and add a small drop of glue to each end of the ladder rung. Again allow to dry thoroughly. 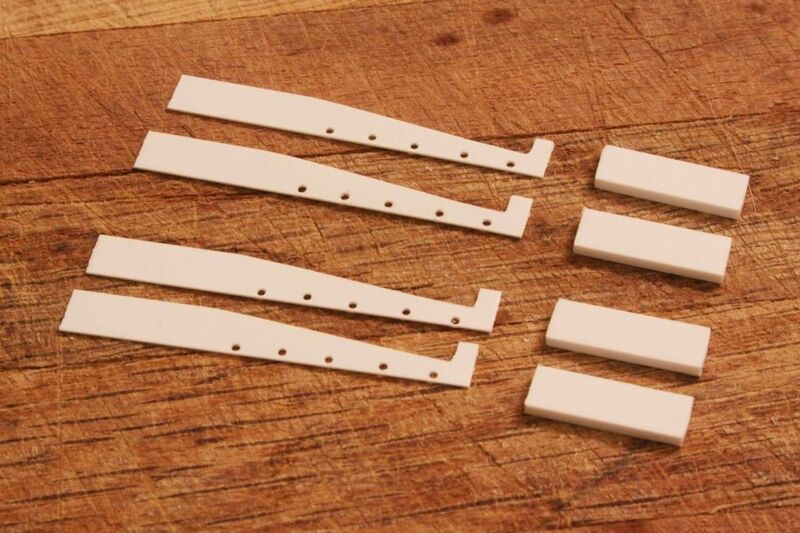 Now in the next step you can carefully cut the side plates to their finished length which will also serve to remove the temporary spacer bars. ANOTHER POINT OF NOTE: In the photos shown here it is still early in the overall construction process. 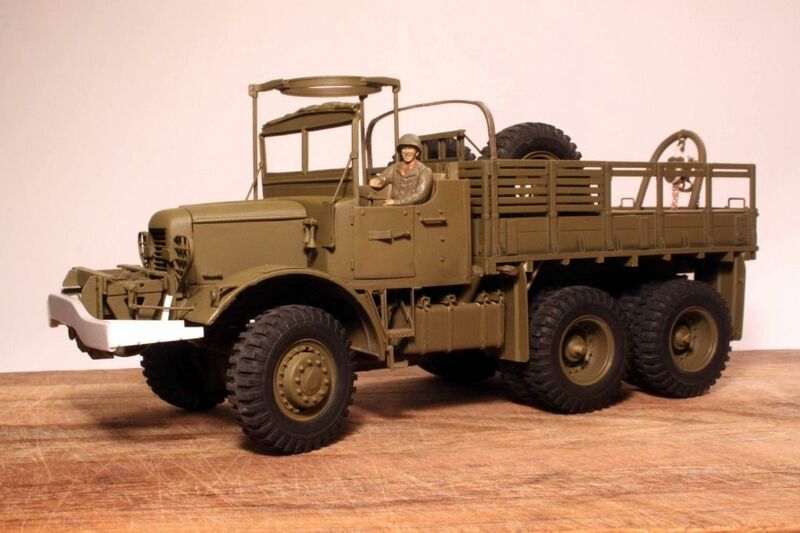 The model here is still wearing the more or less stock Dragon Wagon front wheels which are incorrect for the Mack. 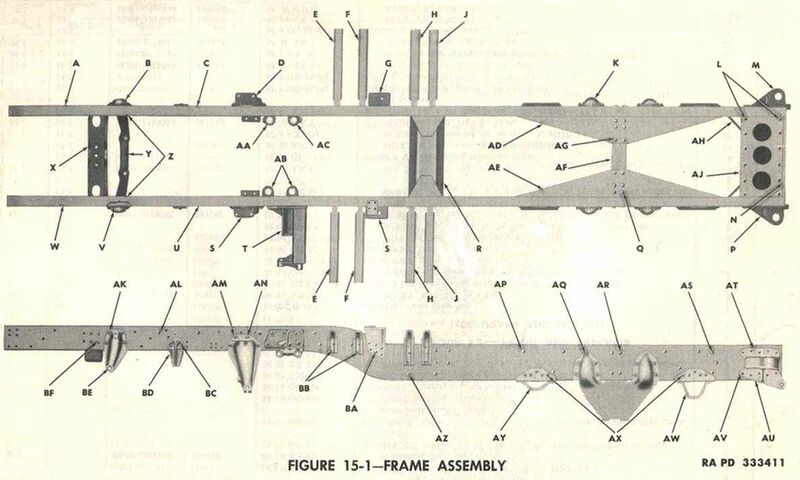 As I say, this construction process can be used to make alomst any custon ladder structure. 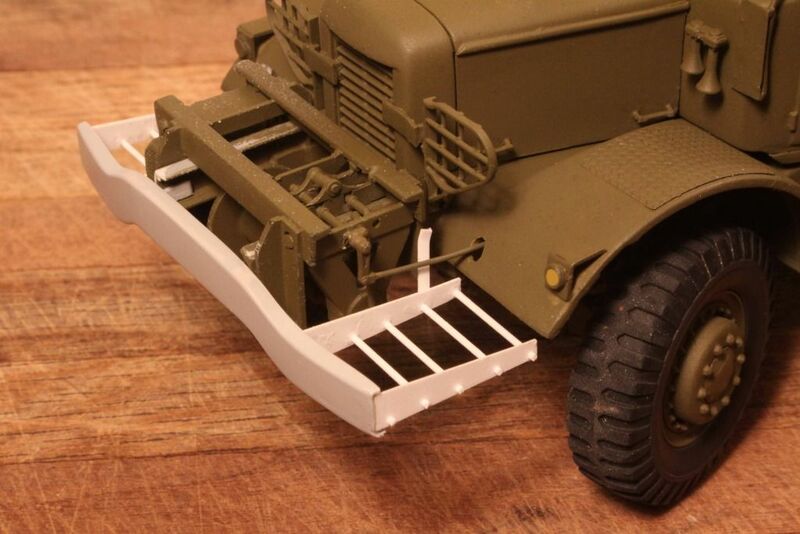 Such as this unusually narrow ladder on a German Blitz "Mule". Completed, installed and painted ladder racks only waiting for the gas cans to be added. 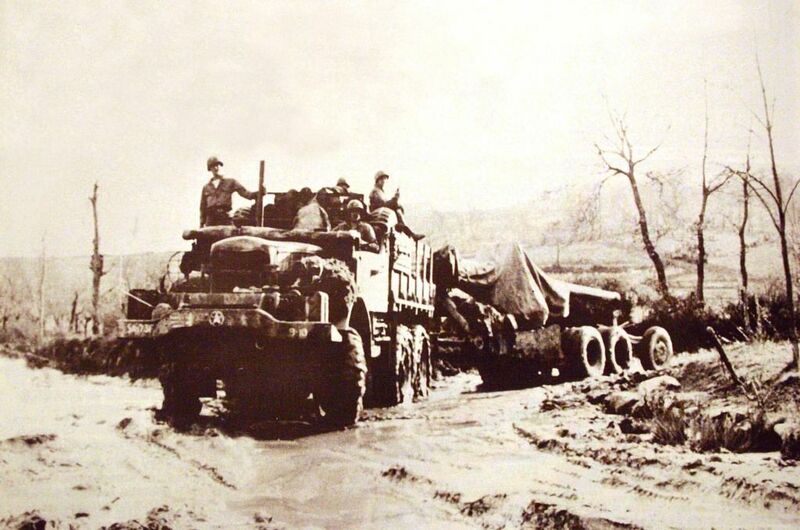 A wartime photo of the NO6 towing the 155mm US gun and behind that, the M1 Limber. The gun must have originally been emplaced by the M4 High Speed Tractor that requires the Limber. In this photo the gun is being relocated by the Mack but the Limber is tagging along behind. 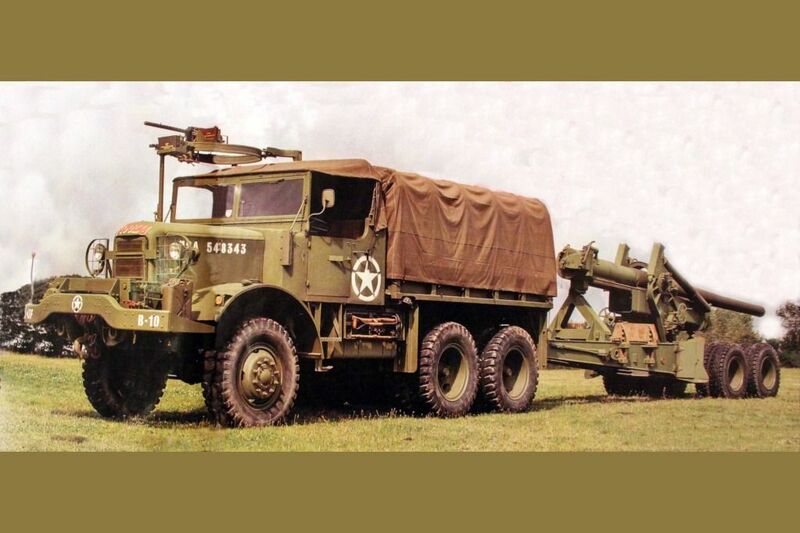 The special Mack designed towing hitch transfered part of the weight of the gun forward to the towing vehicle. 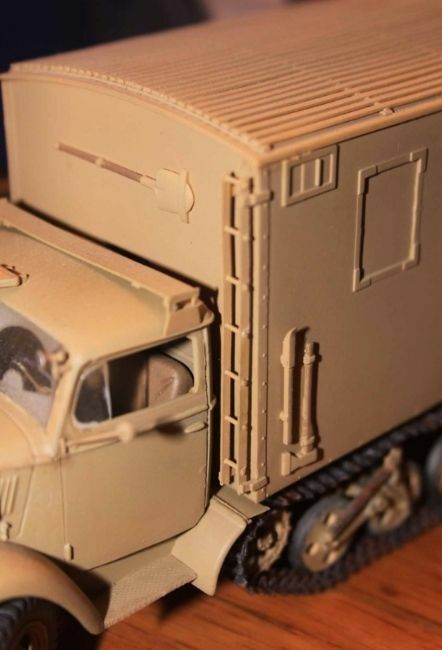 So the Mack, unlike say the Diamond T ballast tractor, did not require the addition of dead weight ballast to gennerate the necessary tractive effort to tow the gun. 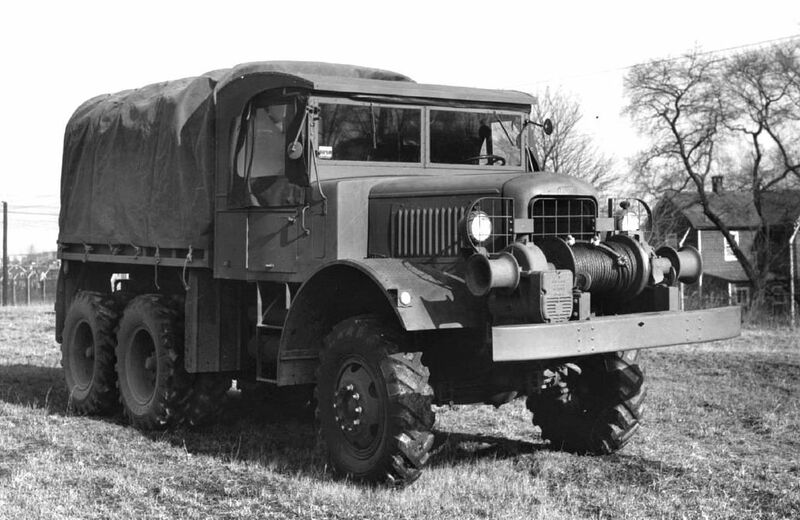 This design conserved fuel and required two fewer tires on the pavement in order to move the load therefore saving on physical drag as well as precious wartime rubber. 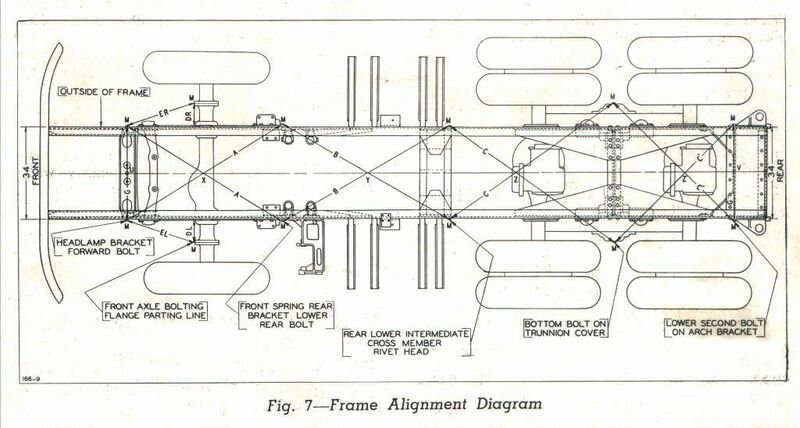 I wish I had had these drawings BEFORE building the first frame for my Mack. It would have saved me a lot of unnecessary rework! 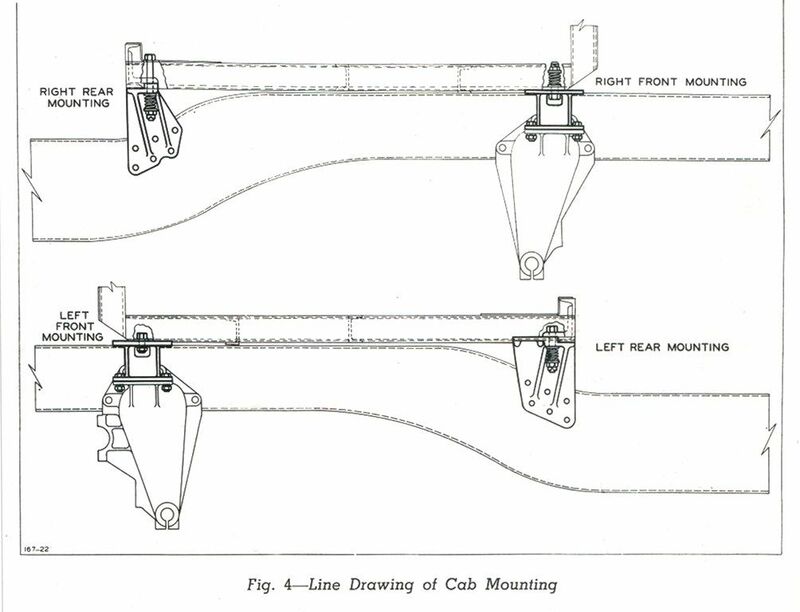 This illustration shows the mounting means for the cab floor sub frame. Note the spring loaded bolts to give the cab some flexibility of movement. 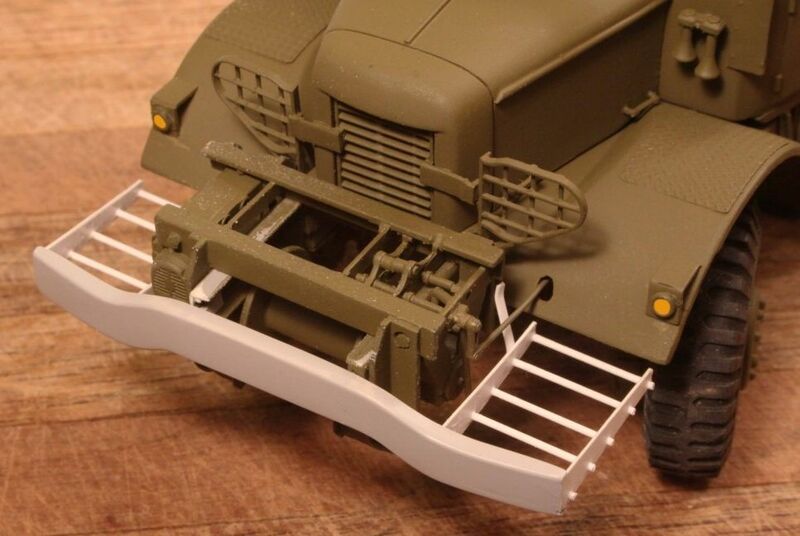 The axle retainer bolts: For some reason this significant detail has been left off the front axle of the Tamiya Dragon Wagon. 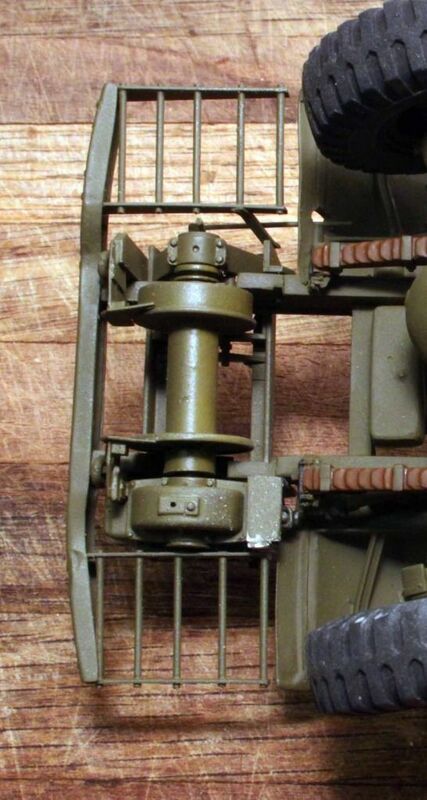 Here is a better view of the Gar-Wood drag brake mechanism in the above photo. Also Note: The oversized engine oil pan extending downward just behind the frame cross member.